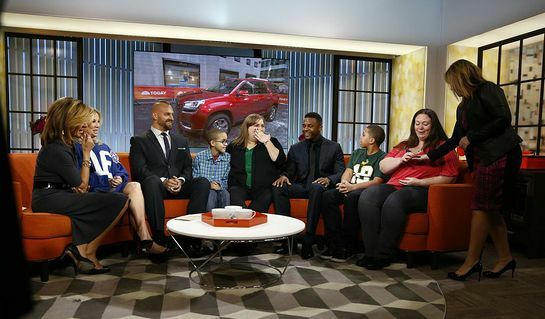 This week, on Kathie Lee & Hoda for TODAY, GMC and Characters Unite – alongside NFL greats Randall Cobb of the Green Bay Packers and Mark Herzlich of the New York Giants – presented two deserving young boys with a brand-new 2014 GMC Acadia and a four year college scholarship. Hoda Kotb, Kathie Lee, Mark Herzlich of the New York Giants, Elijah Williams, Mark's Mentee, Sarah Williams, Elijah's mother, Randall Cobb of the Green Bay Packers, Tyson Weelock, Randall's Mentee, Nicole Weelock, Tyson's mother, Sandra Moore of GMC. The powerful documentary “NFL Characters Unite” kicks off Super Bowl weekend, premiering Friday, January 31st at 7/6c on USA Network. NFL Characters Unite, presented by GMC, profiles NFL stars as they share deeply personal stories of overcoming prejudice, bullying, discrimination, with the goal of helping young people who are currently facing similar challenges. Find out more here.